We package our products in thick freezer-grade plastic, which can safely store your products indefinitely when frozen. The best place to store meat for extended time periods is in a deep freezer, or towards the back of an upright freezer (ie, not on the door). Meats are frozen at peak quality to ensure you enjoy the highest quality meat whenever you are ready to defrost and prepare it. As long as meat is cold to the touch, it is safe to refreeze without cooking. As the USDA notes, “freshness and quality at the time of freezing affect the condition of frozen foods. If frozen at peak quality, thawed foods emerge tasting better than foods frozen near the end of their useful life." That is to say, unlike frozen foods purchased from supermarkets or butcher shops, which may have been on the shelf for weeks before freezing, our products are frozen at peak quality, and will be ready to enjoy when you defrost and prepare them. So -- if you defrosted more than you need, or your meat arrives thawed, it can be refrozen with no loss of quality. The safest way to defrost meat is in the refrigerator. 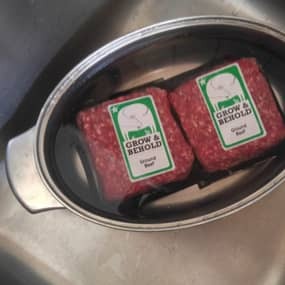 Always place packages on a plate or in a bowl when defrosting. Allow about 24 hours per 5lbs of meat. For a large turkey, this could mean a few days. If you are in a hurry, resist the temptation to thaw your meat in a bowl of warm water. Meat that is left at above 40F is in the danger zone for the proliferation of harmful bacteria. Speedier defrosting can be achieved by submersion in COLD water. Make sure the meat is in a sealed, leak-proof container or bag, and change the water every 30 minutes or so. Small packages of meat or poultry weighing a pound or less may defrost in an hour or less. A 3- to 4-pound package may take 2 to 3 hours. Ground meat and poultry thawed in the refrigerator can be kept for one or two days after defrosting. 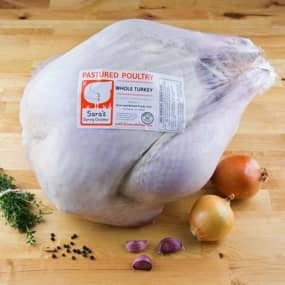 Poultry can last 3-7 days once thawed. Boneless red meat should keep for 7-14 days. Foods defrosted in the refrigerator can be refrozen without cooking, but should be prepared immediately upon defrosting the second time.